• Aspen: This is an economy hot tub that weights 450 pounds and fitted with multiple hydrotherapy seats. The tub comes with a galvanized steel frame, reflective heat barriers and adjustable stainless steel jets. • Innsbruck: This is a sleek spa for two people, with all the features of a bigger spa. The tub comes with an entry step and handrails. The tub has 39 water jets. It is available in multiple colors. 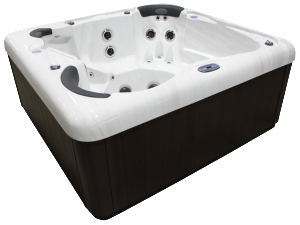 • Innsbruck XLS: This is an elegant hot tub with a vast array of features. You can install this tub anywhere in your house. The tub seats 2 to 3 people and comes with 48 water jets. • Ciara: This is one of the most popular models and is equipped with ergonomic seats. The seats are built to provide a special massage experience. The hot tub seats 4 to 5 people and comes with 49 hydro jets. • Ciara XLS: This is a great package for complete relaxation sessions. The hot tub provides hydrotherapy targeted to all parts of your body. The Ciara XLS is easy to install and easy to maintain. • Avalanche: This model is built with open seating and is a great entertainment package. It comes with a 36” entry door. The hot tub easily accommodates up to 6 people. • Avalanche XLS: The tub comes with a great set of standard features. The seats are designed to offer a unique massage experience. The entry step is also used as a cooler seat. • Everest: This is ideal for big families. The hot tub will entertain up to 6 people. There are 63 hydrotherapy jets to ensure maximum fun. A 7” color LED light and beautiful Balboa controls add to the elegance of this great tub. • Everest XLS: This is a powerful tub that is designed to relax and entertain you. You can set this tub with high-pressure massage streams for your back and neck. This is ideal for 6 to 7 people and comes with 82 jets. • Olympus: This beautiful tub comes with loungers for “his and her”. This tub is fitted with a reverse neck chair and companion seat. The tub is built to seat 4 to 5 people. • Olympus XLS: This is a bigger and beautiful tub with jets that offer whole body massages. A hot seat with reverse neck and shoulder jets adds to the power of this tub. The tub comes with 91 jets. • K2: This tub is designed for extreme therapies. The tub is built with a 360-degree foot dome and offers high quality massages. The tub comes in vibrant colors like most other models. • K2 XLS: The tub comes with a total body massage seat, reverse neck seat and 360 degree foot massage. The hot tub also features seating for 8 people, dual remotes and lighting features. • Himalaya: This tub seats 6 people, fitted with 41 jets and built with a capacity of 335 gallons. • Rainier: This tub is designed to seat 5 people, comes with 45 jets and holds 320 gallons of water. • Newport: The tub is built for 6 people and can hold up to 425 gallons of water. • Matterhorn: This is a beautiful swim spa equipped with the features of a swimming pool and a hot tub. It is great for all kinds of aquatic exercises. It is good for 6 people and holds 2000 gallons of water.